The Department of Infrastructure mapping service have produced constituency maps which are available either electronically or as paper plots. There are two types of maps available. These consist of five basic locator maps and cost £1 per map. 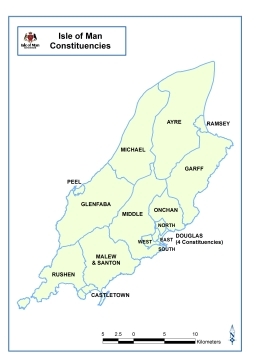 The maps cover (Douglas, Ramsey, Peel, Castletown plus a whole Island map). They can also be emailed free of charge on request. These maps have been designed specifically for election canvassing and show each constituency in higher detail. Depending on the constituency, the maps available are zoomed in on towns and villages or out to cover rural areas. Set of 3 copies of each map for £25.00 (additional copies of maps are charged at £3.00 per extra copy) They can also be emailed free of charge on request. These maps take some time to prepare so may not be available on a while-you-wait basis. It would be advisable to contact Mr Chris Keown in mapping (685924 chris.keown@gov.im ) in advance to check availability. If maps are not readily available the mapping office will take orders and contact the customer when they are ready, usually within 24 hours of ordering. If advance payment is taken, the maps will be posted in a tube. All maps are Crown Copyright, Department of Infrastructure and may not be used for any other purpose without prior permission. Further contact details for the mapping office can be found here together with a map showing its location in Murray House.